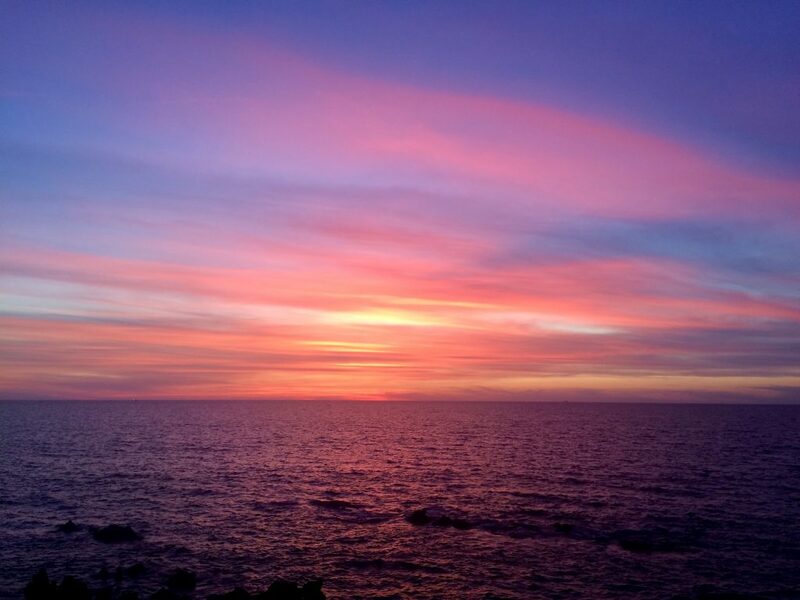 Beautiful sunset – Mazatlán, Mexico. Earth revolves around the sun at the same speed – 365.25 days for one revolution – so there is no real logic to why people talk about the years going by ‘faster every year’. There is a subjective relativity to time though; without sounding morbid the fact is that the older we get the closer we are to the end and the older we get the more that realisation sets in. Time, in effect, is running out for all of us, it just seems to be moving faster the older one gets. The turn of the year seems to bring time into focus, where people reflect on their life – their past, present and future. But in the end of the day it is not about how much time has passed or how much we might have left, it is all about the time we have now. This is something we have to remind ourselves of regularly because it is easy to be hampered by the past or to be scared of the future. But, this moment is yours! There is a lot of great stuff written on the concept of living in the present and as is the case with everything, people can take from it what they want. For me, there are two things I think can help everyone live a happier life. The first is to try and be more connected with the moment that you are in, cut out the noise! Watching a sunset? Take everything in, the sound of the waves, the birds, the clouds, everything! If you are out for a scenic walk, enjoy what is around you, don’t distract yourself with worries. If you are catching up with a friend, how about turning your phone off? You get the point. Be fully present in whatever you are doing. It takes practice in this world of sensory overload. He wrote that over 2000 years ago in his moral essay “De Brevitae Viitae” (“The Shortness of Life”)! Are people any wiser now on how they value their time? I am not so sure. Only you can decide how you value your time and what you believe is the best use of your time. I think this exercise in self-reflection can help people to get the most from their life. For me, it is that difference between the feeling of just going through the motions and the excitement of paving new territory. It is a mindset of challenging yourself to continue learning and developing. Of course, challenging yourself is not enough; you must have the discipline and the courage to follow through on what you want. Every January we see rafts of people signing up for new challenges and looking for inspiration from outside sources for self-empowerment. But so often those short time bursts of motivation come to nothing. For example, why do so many people sign up for gyms in January and then never go? It is because the moment of clarity on the need to exercise more, brought about by the dawn of a new year, is not enough to convert intentions into actions. (Btw, you don’t need a gym to stay fit). The same applies to all parts of one’s life and why people revert to old habits after the early January awakening. ,A change of mind-set does not happen overnight; it is an ongoing process. Rather than focusing ones energies on the end goal, I believe people are better served by focusing on developing their inner discipline (habitual exercise can be a means to building discipline) in order to realise a real and sustainable change, whatever they want it to be. If you become more self-aware in terms of how you live your life then exercise, diet and life balance will be something you are always conscious of. It won’t feel forced. You don’t need to be reminded to get fit in 2018; you can rely on your own inner discipline to remind you. You will have that independence of mind to be more in control of your own decisions in all parts of your life. It was roughly this time last year I made the bold decision to leave a relatively safe life in Dublin to pursue a new challenge in learning Spanish and to experience more of the world. Ten years ago I had just moved back to Dublin from San Diego after five years living in the US; little would I have thought that a decade later I would be in the midst of an adventure in Latin America. If I look back at the last decade there are a few things I would do differently but I wouldn’t change my decision to hit the road again. Ultimately, when we reminisce on life we conjure those standout moments; if life is a just a series of present moments we inevitably focus on the highlights when we look backwards. After all, it is our experiences that define our eye blinkingly short adventure on a planet that is over 4.5 billion years old. I don’t have any New Year’s resolutions. They are a waste of time. I am just going to continue to try and live the life I want, filled with new experiences, learning and development. We all write our own adventure but when we reach the end some look back with more regret than others. Yet, the great thing is that no matter what your age, you have the opportunity to make new moments now. If I was to offer advice to all those inspired by the dawn of a New Year and serious about making changes in their life, I’d say: forget the New Year’s resolutions, start changing your mind-set to really make and sustain the changes you want in terms of how you live your life. Be more present, value your time and develop your inner discipline. Start now. Otherwise, just join everyone else that talks a big game in January every year!